Devastating Losses Are Coming: What Is Your Advisor Doing About It? By Nick Barisheff of BMG Group Inc. I hold financial professionals who recommend monetary gold to their clients in the highest esteem. It is their sage advice that will protect investors from the unprecedented dangers they face today in the markets. However, many advisors are no longer permitted to recommend physical gold or precious metals in client portfolios as a result of the new rules defining risk in mutual funds. Many clients who had been holding gold for years were forced to reduce their positions last year by their investment advisor’s dealer. 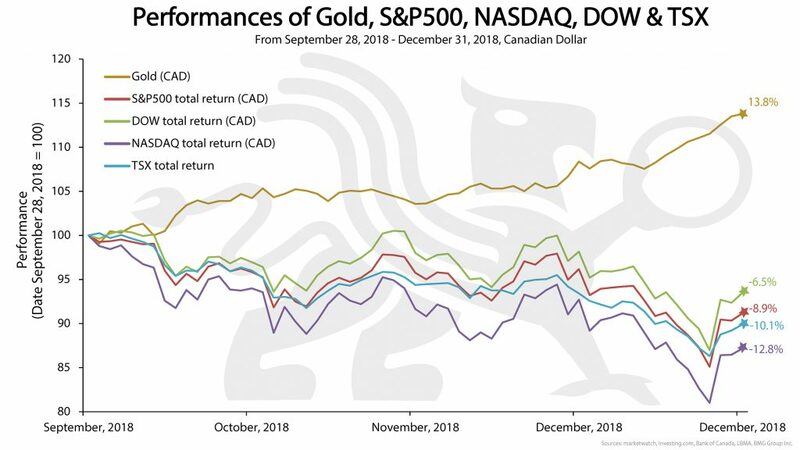 The timing for this couldn’t have been worse, as the resulting rise in their gold holdings would have reduced the losses in their portfolios from the market carnage we have witnessed since late September. The equity selloff that began in October is intensifying and threatens advisors, MFDA dealers and investors with a high probability of a 50-70% loss of capital and a corresponding loss of income in 2019. A decline of this magnitude will have devastating effects on retirement portfolios. Many investors will not recover in their lifetimes. This could snowball into advisors and investment dealers no longer being viable. The Everything Bubble appears to be bursting and, as history has shown, investors’ fears can easily grow into a panic. Referencing the above metrics, securities regulators have made a grave mistake in re-rating monetary gold to a medium-high risk relative to ‘Know Your Client’ (KYC) forms. These regulators, fund dealers and, by extension, their various compliance enforcement departments have ignored the fact that the Bank for International Settlements (BIS) that sets the rules for central banks and commercial banks has stated that “monetary gold is a risk-free asset on par with US Treasuries and US dollars.” They have also hamstrung investment professionals and their clients from protecting themselves with an asset that has done just that for over 3,000 years. In spite of nothing having changed in BMG funds, the new rules mandated by the provincial regulators across the country raised our official risk rating, making BMG funds unsuitable to many clients who have held these funds for years. An investor in a typical balanced portfolio should be concerned with not being properly diversified. For example, an equity portfolio can be diversified by style, capitalization and sector – but all equities are categorized as the same asset class. Gold, however, is an asset class unto itself with no substitute, no counterparty risk, no management risk and no default risk. Therefore, concentration limits in the traditional sense do not apply to monetary gold. I have followed Mr. Barisheff for many years. I agree with his recommendations on gold. Own more gold and sleep better. President at BMG Group Inc.
Nick is the President and CEO of BMG Group Inc. Widely recognized as an international bullion expert, Nick has written numerous articles on bullion and current market trends that are published on various news and business websites. He has appeared on BNN, CBC, CNBC and Sun Media, and has been interviewed for countless articles published in leading business publications across North America, Europe and Asia. His first book, $10,000 Gold: Why Gold’s Inevitable Rise Is the Investor’s Safe Haven, is a must read for every investor who is seeking the safety of sound money and will benefit from Nick’s insights into the portfolio-preserving power of gold.